Earlier in the football season, I found myself telling someone that I had more faith in the current leadership of the Buffalo Bills than I’ve had in a long, long time. In particular, the combination of head coach Sean McDermott and general manager Brandon Beane has been professional. They seem to know what they are doing, as evidenced by a trip to the playoffs last season. Even though it was a lucky combination of events that prompted it, the Bills still reached the postseason. But that faith has been shaken a little bit by the way the team has handled its quarterback situation this fall. Admittedly, finding a worthy pro passer these days is not an easy task. The Bills have been looking for a long-term answer since Jim Kelly retired. Still, the current effort hasn’t gone particularly well this season, in part because the coaching staff apparently had a little too much faith in Nathan Peterman. Let’s take a look back at all that has happened at the position this year, and it’s a lot. At the end of last season, Tyrod Taylor was viewed as a player with some talents but not that long-term answer. The Bills were looking to the draft to find a solution, and it might have been nice to have Taylor around as something of a tutor. After all, the team did win nine games last season. Maybe the team didn’t want to pay what he wanted, and maybe it was simply anxious to move on from him, but Taylor was sent to Cleveland for a draft choice. 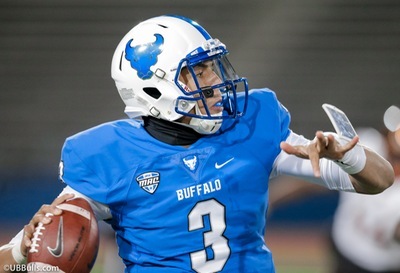 That made it almost imperative for the Bills to add a top-rated quarterback in the draft. After a series of moves, they got their man in Josh Allen. He came into town with plenty of skills but was someone who probably needed some development time before he could fully display his abilities. Therefore, it was considered a good idea to acquire another quarterback who had been around for a while. A.J. McCarron was signed as a free agent, and Peterman – who saw limited playing time in 2017 – was also around. The three of them were on the roster in training camp, and McCarron promptly got hurt. That left Peterman – who looked good in workouts and the games that didn’t count – and Allen at the position. McCarron recovered, led the Bills to a win in the preseason finale – and was shipped to Oakland for a draft choice on cutdown day. So much for the importance of veteran leadership somewhere on the depth chart. The Bills obviously thought Peterman had improved in a year, since memories of his five-interception half against the Chargers in 2017 had become part of Bills’ folklore in the succeeding months. They also apparently thought that Allen could serve as a second-stringer if necessary, because NFL quarterbacks do get hurt every so often. But Peterman played as if he hadn’t improved a bit in the opener against Baltimore, as he couldn’t guide the offense to a first down – let alone a field goal. Exit, stage left. Allen came on in relief and did a little better – admittedly not a high bar. That led to his elevation to starter in Week Two. Allen helped the Bills win two games, although no one credited the offense for most of that. That led us to the past week, a dramatic one as these things go. Veteran Derek Anderson was signed as a free agent. That – or something similar – probably should have been done about a month ago, if the plan was to provide Allen some tutoring and support as well as be a passable backup when needed. But Anderson wasn’t ready to enter the lineup against the Texans on Sunday, and wasn’t active. So when Allen hurt his elbow and went to the sidelines for the rest of the day, Peterman was the next man up. Heck, he was the only man up. History teaches us that when a starting quarterback gets hurt in the middle of a game, the team is in big trouble for the rest of the day. Frank Reich was considered a fine backup quarterback in the day, but even he struggled when he turned up because of a mid-game injury to Jim Kelly. To Peterman’s credit on Sunday, he did throw a touchdown pass soon after arriving to put the Bills in front. But the Texans tied the game on a field goal thanks in part to a huge pass interference penalty. Then Peterman tried to move the Bills down the field for a winning score in the final minutes, only to throw a perfect pass to Texans defensive back Johnathan Joseph – who easily returned it for the winning touchdown. Another Houston interception on a deflected pass ended Buffalo’s last hope. 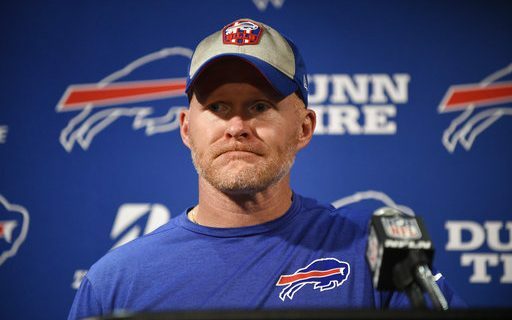 With Allen’s situation in flux for the time being – he was called “week to week” on Monday by McDermott – Anderson’s crash course in the Buffalo offense will be upgraded to warp speed this week. If Allen can’t go, Anderson will be needed in the lineup. Peterman can’t be considered a viable option even if he does need to stay on the active roster until Allen is healthy. In the long term, Peterman probably will have to go elsewhere if he hopes to have a pro football career. Evaluating football talent is difficult under any circumstances. Trying to sort out the depth chart at 21 positions is never easy, but at least evaluations take place away from a bright spotlight. The quarterback position is different, because everyone is watching and has an “expert” opinion. When decisions don’t work out at QB, the team doesn’t win and people lose their jobs. McDermott and Beane built up a lot of credibility with their job performances last year. But their faith in Peterman in 2018 and the resulting play on the field has drained a little of that. Everyone will be watching to see how they handle the twists and turns that are further up the road this season.